The peoples are forged through history, with the efforts of their children, who every day since its genesis have worked with perseverance and sacrifice the present and that project to a promising future. This canton is born, with the presence of the settler of the mountains who fought in an adverse environment, perhaps unimaginable, where the rain, swollen rivers, made tremble with fear to the toughest and temperate man of spirit. Encouraged by the hope of reaching the predestined place, to grab hold of his family and see his children grow up, the challenge is to start without having other support than his pulse wielding a machete to open the path of progress. The land of Canton Mera has a pronounced relief, there is a mountainous area on the northwestern side that emerges from the Central Mountain Range of the Andes, then we find a plain or plain where the town of Mera is settled, and the parishes Shell, and Madre Land, and where agricultural work predominates. To the south we find the Pastaza River, to the north the Anzú River, Blanco and Pindo with crystalline and resting waters, the first two. To the east, a little lower we are at the same height of Puyo. The average temperature is 20.2 ºC, with an average annual rainfall of 4222.7 mm. Being the months of August and September the driest and June and July the rainiest. In the Mera Canton there is a great variety of plants, from trees with tall stems such as pilche or chanul, cedars, laurel, cinnamon, sandi, maria, tamburo, chontacaspi, guayacán, mahogany, etc., Mera itself has a lush vegetation. Among the animals that are in the area we have from the most ferocious as the panther, to those lesser as: tigrillo, fox, tamarins, deer, tapir, guatusa, armadillos, badgers, cuchucho, monkey, squirrel, bear. In terms of birds: pava, torcaza, owl, partridge, rock rooster, toucans, cucupagchos, variety of multicolored birds, which together embellish the environment and make it captivating. Cantonization parties - April 11. - Games are held with the participation of 10 indigenous nationalities of the Ecuadorian Amazon in ancestral activities such as: spear, dunk, blowgun, bow and arrow, raft, balance, traditional dances, shamanism, crafts, gastronomy among others. Chontacuro: Dish prepared with the worm of the palms of chonta, with an average of 6 cm, is very desirable for its flavor and proteins. It is also attributed to several healing properties for the stomach and is prepared in various ways, roasted on the grill, fried or in mayonnaise. Maitos de pescado y palmetto: It consists of fish and heart of palm wrapped and tied in leaves and placed on the grill for about 30 minutes and with little seasoning. It is served with cassava, Chinese potatoes or green plantains. Chicha de yuca or chonta: It is a famous drink of the indigenous nationalities. It is prepared with cassava pulp or fermented chonta, water is added and it is ready to be taken. It has a swimming pool, sport fishing and offers the delicious snail ceviche. In total there are 11 floors, built on the basis of a giant 200 year old matapalo tree, it is the largest tree house in Ecuador, a true record. The inhabitants of the Shell parish, especially children and young people, enjoy this natural beauty with absolute tranquility and without any concern. In addition, on the banks of the river there are places to camp and take walks and in the same way there are viewpoints to rest contemplating the landscape and at the same time taking photographs. Area where we can see the typical dwelling of the sector and species of flora and fauna with a low level of the cantonal head. In addition, this forest is used for tourism, within which some indigenous communities are involved. It is hydrologically crossed by the Pastaza River, which is the main secondary drainage of the Putuimi River, which is a tributary of the Puyo River and drains with a flow that, due to its cleanliness, sustains the life of many fish species. It is managed by the Yawa Jee foundation, which in the Shuar native language means "the house of all animals", together with the indigenous Kichwa community of Santana. It is a project of recovery of animal species and protection of the forests of that sector where they recover and reintroduce species of reptiles and mammals that are threatened by hunting and destruction of their natural habitats. It is the most rural parish of the canton located 11 km from the Shell. This has its own characteristics within the canton possessing nature and Amazonian indigenous cultures, it is a favorable place for the development of Ecotourism, community tourism. Here Kichwa and Shuar communities have settled, which in some way maintain their cultural wealth and that is being used by them for the improvement of their quality of life, being themselves the providers of tourist services. Their state of conservation is relative, since they have introduced goals and lifestyles that are not theirs such as clothing and equipment used in everyday life, but they maintain their own cultural identity without trying to isolate themselves , but stay as much as possible in their cultural traditions. The majority of the inhabitants of Canton Mera who are of Kichwa nationality are on the banks of the Pastaza River in the Madre Tierra parish, in Puerto Santa Ana and several colonies of Kichwa settlements, where certain groups of Shuar also stand out sporadically. they reside in this parish. The water temperature of this waterfall is 25 ºC. The customs of this beautiful land are the traditional dances performed on each important date of the community. • Games: At parties the most exciting are the community meeting, games, pyrotechnics, folk parades and more. • Puerto Santa Ana: Located on the banks of the Pastaza River, this site is a meeting and transportation point for the communities that live on the other side of the river, since there is a tarabita that facilitates the crossing of this river, this tarabita is one of the largest in the country with a width of 500 meters. This place is characterized for being most of its cultivated soils. It has shades of corn, yucca, banana, Chinese potatoes, naranjilla, lemon. There are guabas trees, whistles and other exotic fruits that exist in these forests. This viewpoint is 3 km from the Shell. • La Delicia jams: Here you can learn about the process of making jams from various fruits of the area such as: guava, araza, pineapple or papaya. 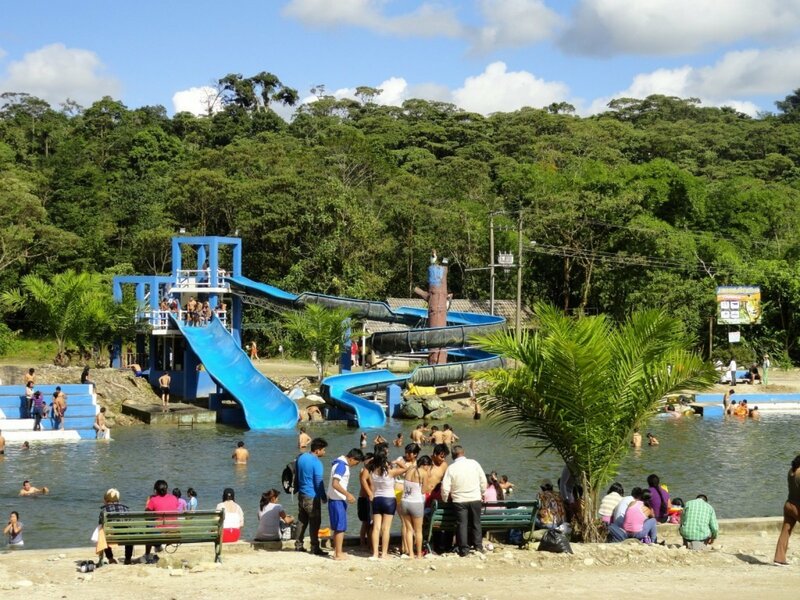 • Río Pindo Tourist Complex: It is a spa built by the Municipality of Mera in the waters of the Pindo Grande River in order to promote tourism in the Shell parish. The dam consists of two side doors. It also has sports courts, slides, changing rooms, bathrooms. The complex has become the leisure and recreation center.